When I think back over the last few years, it is hard for me to remember a day that has not involved an episode of Peppa Pig at some point. 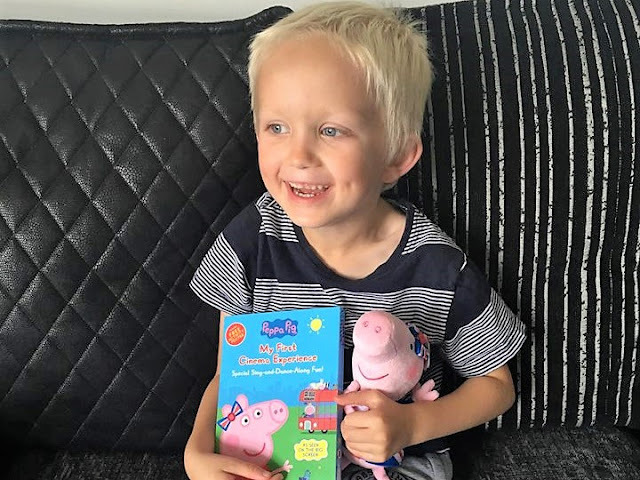 Whether that be watching it on television, on the kids tablet, or my mobile phone, all three of my children have grown up watching and enjoying the cheeky yet lovable Peppa Pig. She is a character that most children love and her popularity is proven through the huge selection of episodes, merchandise and even attractions available. Earlier this year, we learnt that Peppa Pig would be heading to the cinema in an exciting new big screen adventure. It was described as a perfect introduction to the cinema for preschoolers and offered an hour of snorts, giggles and Peppa fun. This sounded like the perfect opportunity for me to introduce Riley to the cinema and we both enjoyed a lovely morning out to watch it, shortly after its release. It was great to be able to watch some new stories and to also be introduced to some new characters who were Policeman Panda and Mrs Crocodile. There was also plenty of interactive elements to join in with including singing and dancing, which Riley really enjoyed. Last weekend, we received a lovely package through the post that contained a copy of the Peppa Pig My First Cinema Experience DVD along with a cute plush toy. Riley was really excited as he remembered our little trip to the cinema and was now happy that he would also be able to watch it at home. I made some home made milkshakes and grabbed a bag of popcorn and we snuggled up on the sofa to watch the new DVD. The DVD features nine episodes which are London, The Police, Canal Boat, The Zoo, The Outback, Surfing, The Great Barrier Reef, Boomerang and Move to Music. In between the episodes, there is interactive live action content that encourages you to sing and dance along and the DVD also includes some fun songs such as Wheels on the Bus and The Muddy Puddle Song. If all that entertainment wasn't enough, the DVD also contains a free activity poster which features some puzzles and colouring in fun. Riley really enjoyed the DVD and I am sure it will be one that will be watched over and over again. He giggled away through all the episodes, with his favourite ones being The Zoo and London. As the DVD is only 70 minutes in length it was also the perfect length of time to keep him interested and entertained. We would definitely recommend Peppa Pig My First Cinema Experience to any Peppa Pig fans! The DVD is available to purchase from Amazon, as well as other good retailers. I also have a copy of the DVD to give away to one lucky winner. If you would like to enter, please do so using the gleam form below. Good Luck! The prize is as stated and no cash alternative is available. Approximate prize value is £8. Competition closes on Wednesday 14th November 2017 and the winner shall be notified within 7 days of the closing date. The winner will have 7 days to respond to the winning email to confirm their acceptance of the prize, before an alternative winner is drawn from the remaining eligible entries. Disclaimer: We were provided with a complimentary copy of the DVD and plush toy for review purposes. This post contains an affiliate link. Opinions are my own. We love Suzy Sheep in this household! Thanks for the competition. Suzie Sheep is a fave in our house! Miss Rabbit she is Wonder Woman with all her jobs! We love Pedro - we're a bit like pedro, always sleeping!